Smoke in the Sky concludes a two-chapter Gears of War Act in which players fight through several waves of Locust to reach a COG APC. The opening of Smoke in the Sky--an explosion of a building--sets a harried, desperate tone for the rest of the chapter. The player feels outgunned and undermanned as the level forces the player into multi-directional combat while trying to escape. Smoke in the Sky is a gameplay-centric map that puts players constantly under fire from Locust. The original iteration of the map featured never-ending flow of enemies, exhausted play testers as it provided no points of rest between combat. Nearly half of the level changed completely from design to completion. Slower set pieces such as a stationary turret and a final defensive encounter were eliminated in favor of more mobile, player-involved action sequences. These changes improved the level's gameplay, providing a cohesive and balanced experience. Good gameplay is central to the map's implementation. Players face different types of enemies with each encounter. After the first basic fight against three Locust, each successive fight presents enemies from different heights, locations and ranges. Midway through the level, a defensive set-piece breaks up the speedy pace--by way of detonating an impassable gate. The level's timing of encounters give the player a complete and exciting gameplay experience. Given that Smoke in the Sky concludes a Gears of War Act, players need context to understand the meaning of the level. For this level, Marcus Fenix kicks down a door and faces a squad of Locust as the factory behind him explodes, causing debris from the building to fall into the first area, forming cover that the player uses. By linking changes in the level to events in the movie and observing basic cinematic techniques--ensuring the camera moves within a 180 degree arc, effectively using quick cuts--the player feels invested in the events of the movie. Plus, the action-packed nature of the matinee supports the themes of the level: urgency, action and escape. The environment conveys the idea of a city in the aftermath of a Locust attack through environmental storytelling. 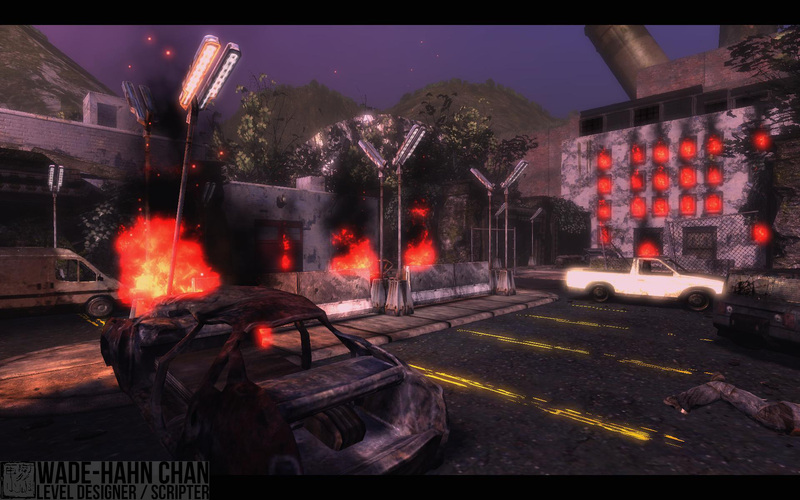 The map contains three environments: the interior of an Imulsion refinery, the exterior parking lot of the refinery and its main gate and the road leading to the outskirts of a small city. Evidence of violence links the three areas. Dead civilian bodies, burning cars and destroyed buildings litter the areas. In the third area, past the refinery, a destroyed COG defense location shows defeated first line of the refinery defenders. The player sees the story of how occurred in the area prior to the player's entrance.